Venezuelans Stock Up On Toilet Paper Amid Shortage : Parallels The government of President Nicolas Maduro announced this week that it would import 50 million rolls of toilet paper to meet the growing demand. The oil-rich country already suffers from a shortage of medicine, milk and sugar. A woman who just bought toilet paper at a grocery store reads her receipt as she leaves the store in Caracas, Venezuela, on Wednesday. The government says it will import 50 million rolls of toilet paper amid a shortage. Venezuelans may be used to a dearth of medicine, milk and sugar, but there's a new shortage that's, shall we say, a bit more problematic: toilet paper. The government of socialist President Nicolas Maduro announced this week that it would import 50 million rolls of toilet paper to meet the growing demand. "We will saturate the market so the people will be calm," Commerce Minister Alejandro Fleming told the official AVN news agency. But it appears that the people aren't very calm: The Associated Press reported Thursday that Venezuelans scrambled to stock up on the precious commodity. "Even at my age, I've never seen this," 70-year-old Maria Rojas told the AP. 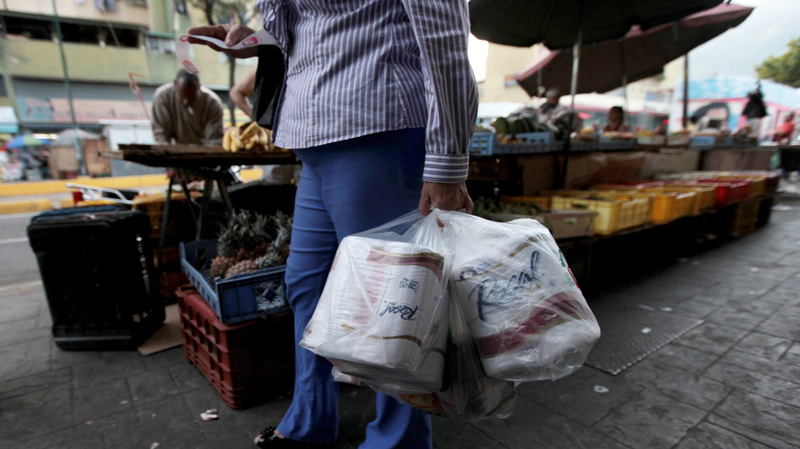 Another woman, Maria Perez, who walked out of a supermarket in downtown Caracas with several rolls, told the agency: "Here there's a shortage of everything — butter, sugar, flour" — but "there always used to be toilet paper." But Fleming, the commerce minister, blamed the shortage on excessive demand caused by "a media campaign." The shortages in Venezuela come despite its vast oil wealth; OPEC estimates the country has the largest oil reserves in the world. The late President Hugo Chavez used the country's oil revenue to act on his socialist vision, which benefited the country's poorest people. But some of his policies have hurt the economy. "Economists say Venezuela's shortages of some consumer products stem from price controls meant to make basic goods available to the poorest parts of society and the government's controls on foreign currency. Many factories operate at half capacity because the currency controls make it hard for them to pay for imported parts and materials. Business leaders say some companies verge on bankruptcy because they cannot extend lines of credit with foreign suppliers." As NPR's Carrie Kahn reported, along with the food shortages, Venezuela also faces high inflation and a recent 30 percent devaluation of the national currency. "During his presidency, Chavez diverted much of that potential [oil] wealth to Venezuelan consumers in the form of cheap gasoline (18 cents per gallon or less). He propped up the Castro regime in Cuba, and he offered Venezuelan oil on highly preferential terms to 18 Caribbean and Latin American countries through an energy alliance he called PetroCaribe." But with declining oil revenues and growing economic problems at home, Maduro may not have the luxury enjoyed by his late mentor and predecessor.